From 'Sketch by Sketch, Along Nova Scotia's South Shore', by Emma Fitzgerald. Published by Formac 2017. Emma is a regular resident at the Fairbanks, and instructor at the Lunenburg School of the Arts. The Fairbanks is the home of Douglas “Fairbanks” Bamford. Fairbanks has been a home away from home for wayward artists since 2012. Fairbanks offers comfortable accommodation in a corporative setting where artists interact in a friendly communal living space with good food and lively discourse on the arts. 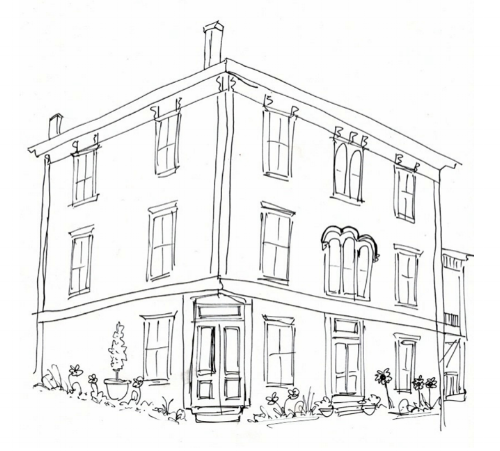 Situated in the centre of Historic Lunenburg, a UNESCO World Heritage site, Fairbanks is a large and spacious victorian home with numerous workspaces within the house. Musicians, writers and visual artists will find that Lunenburg has much to offer and inspire the creative mind. The team at the fairbanks is willing to help make introductions to both a cultural and industrial infrastructure in Lunenburg, offering artists opportunities such as working at the Lunenburg foundry, working with the world-class LAMP music school, or opportunity to sail with numerous ocean-going vessels.